Ieri, oggi, domani (Yesterday, Today, and Tomorrow), came out in the 1960s and is among Vittorio De Sica’s most popular films. It tells three stories in three very different Italian cities. However, if we put aside those views of Naples, Milan and Rome for a moment (coupled with the exquisite performances of Sophia Loren and Marcello Mastroianni), the title of the movie itself may well describe the enduring shadow of racism over the Bel Paese. The Italian people urgently needs to revisit some key passages in its history in order to understand, and combat, the persistence of structural violence and anti-immigrant sentiments. It is no secret that the country of Dante and Garibaldi has become the scene of escalating acts of violence against immigrants. In 2011, a citizen by the name of Gianluca Casseri murdered two Senegalese market traders in Florence. Five years later, a Nigerian immigrant called Emmanuel Chidi Namdi was beaten to death in the town of Fermo. He had been walking peacefully with his wife when his murderer called her a “monkey”. Last year, a 65-year old Italian man killed Idy Diene, a Senegalese resident who sold umbrellas and leather bags next to Ponte Vecchio in the Tuscan capital. In June, Soumaila Sacko, a young immigrant from Mali, was shot – just like the others – on the basis of his skin colour. Of course, these are a few of the hundreds of cases that have been reported, and there is reason to believe that there have been many other acts of violence that have gone unreported as well. This is why one of Michelle Bachelet’s first actions as the UN High Commissioner for Human Rights was to send inspectors to Italy to ensure the protection of migrants in light of violence against asylum seekers and visible minorities, in general. In truth, even though there has been more attention on the problem in recent years, racism has long been rampant throughout the country. Some people might remember the tragic homicide of Giacomo Valent, a 16-year-old who was stabbed to death by his classmates in 1985. Or the mortal pain inflicted upon Abdul Salam Guibre, a young adult from Burkina Faso, who was killed because he had supposedly stolen a packet of biscuits. According to a 2008 poll, 68% of Italians were particularly eager to banish the 150,000 Roma people living in Italy at the time. Similarly, a 2015 poll found 86% of Italians viewed Roma in Italy unfavourably. Last year, journalist Luigi Mastrodonato found that there has been an average of one racially motivated physical assault every two days since the current government came into office. Indeed, post-election Italy has provided fertile ground for hate crimes from the very beginning. With the support of the populist ‘Cinque Stelle’ Movement (M5S), the ‘Lega’ party has found a way to awaken and, in most cases, aggravate chauvinism and other discriminatory attitudes in Italians. Interior minister Matteo Salvini, who is also the leader of the ‘Lega’, has articulated a right-wing, anti-immigrant, nativist, protectionist and Eurosceptic political stance that is reminiscent of what figures like Marine Le Pen and Donald Trump stand for. Photo: Ministero Difesa. Beyond any doubt, the nationalist and openly racist discourse of some politicians has contributed to a dehumanizing portrayal of immigrants in many regions of the country. On January 15th 2018, Attilio Fontana, the incumbent governor of the Lombardy region, lectured his followers on the threat African immigrants posed to the preservation of the white race and Western culture. A wave of insults and warnings on the perils of migration flows immediately ensued. In response to such remarks, Cecile Kyenge, Italy’s first black minister, has reminded her colleagues that “words are weighty, and when they come from a politician, they risk having a very negative impact.” In 2013, Senator Roberto Calderoli called her an “orangutan”. Soon after this flagrant statement, extremists saw an opportunity to continue insulting her and throwing bananas at her in public appearances. In effect, many analysts attribute the dramatic increase in racist attacks to the government’s anti-immigrant rhetoric. 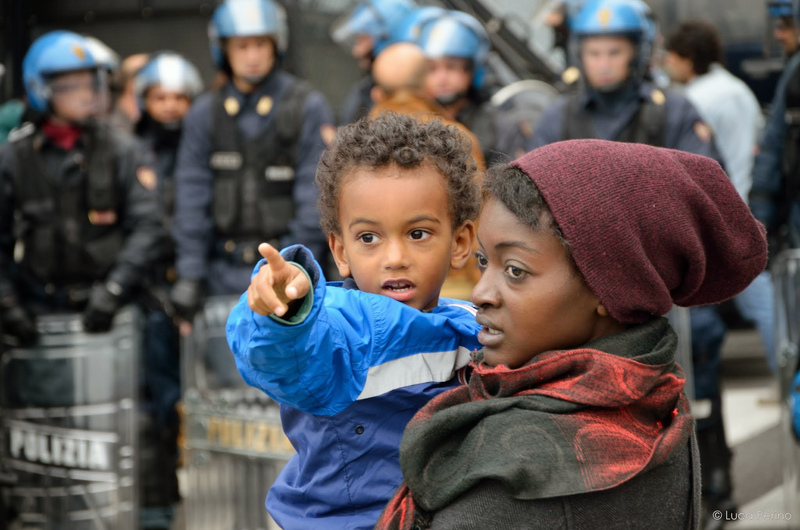 The consolidation of racist political movements like the ‘Lega’ or ‘Fratelli d’Italia’ has been key to both the exacerbation and legitimation of xenophobia. Recently, Salvini’s ‘Decreto sicurezza’ has infused an air of uncertainty all over the country as it aims at the forced repatriation of thousands of immigrants. In consonance with the vast majority of populists, Salvini and his comrades have made immigrants a scapegoat for all of the country’s issues from unemployment to insecurity. If we want Parliament and the government to address the needs of immigrants as well as to those of minorities in general, politicians and authorities must be held accountable for everything they say and do. And yet, how is it that a nation that has received people from all corners of the world for many centuries has such a deep-rooted racism? Igiaba Scego from the International Centre for Humanities and Social Change at Ca’Foscari university in Venice believes the answer lies in the past. Despite the lessons learned from its colonisation of African countries (Eritrea, Libya, Somalia and Ethiopia), and from its own occupation by the Spaniards, the Arabs, and other peoples, Italy “persists in denying its mixed-race identity as a country made of diversity”. Moreover, Scego raises an important point when she makes the case for a more democratic representation of ‘Italianness’, seeing that ethnic minorities “barely exist in politics, films, books, newspapers”. But perhaps this lack of representation, and racism in general, can be more easily understood as the vestiges of the fascist era. During the fascist period, Benito Mussolini put into effect many anti-Semitic laws that have a lasting legacy today. Some of the laws contained in what was known as the Manifesto della razza (Racial Manifesto) prohibited higher education, free movement and marriages with Italians, as well as restriction from professional jobs. Although it mainly focused on Jewish people and the natives from the colonised territories, Italian leggi raziali (racial laws) enforced from 1938 to 1943 by Mussolini’s government set a precedent for the degree of hatred and bigotry we see today. Except now the spectrum of potential victims has broadened. The crucial difference is that today there are many who openly oppose the measures of Salvini’s government, without fearing repression and censorship from the State. Today, contrary to what demagogic authorities want us to believe, racist attacks are neither commendable nor permissible. Today is a time when we can look behind, learn from our history, and make our own future. Indeed, we Italians can now choose to break from the past, learn how to move forward, and put an end to our xenophobic society.